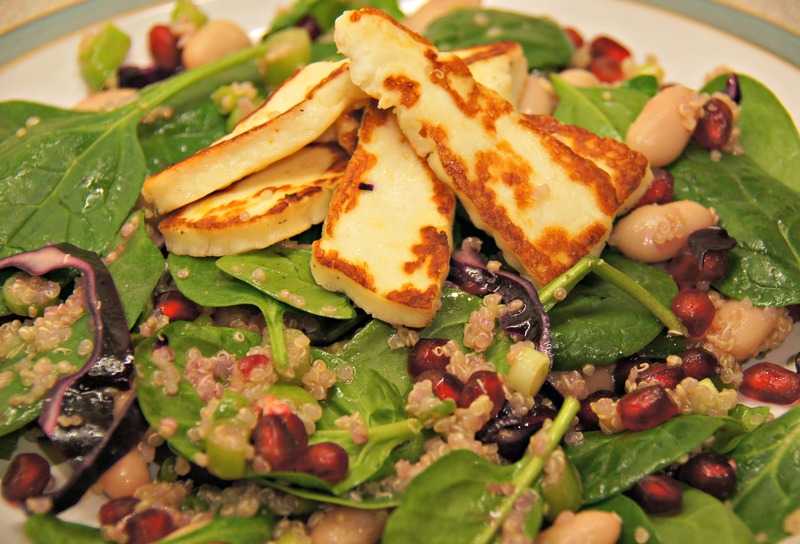 A vibrant Halloumi Salad, packed full of nutrients to battle those winter blues! This refreshing gluten free salad starts with a bed of earthy quinoa, spring onion, red cabbage and spinach tossed in a light tangy lemon oil dressing, with lashings of sweet juicy pomegranate and to top, a crown of crisp warm salty halloumi. Guaranteed to delight the taste buds! I was inspired to create this salad after a visit to London last week, where I had a halloumi salad on a bed of quinoa and spinach and it was there I discovered just how well quinoa works in a salad. I had never used quinoa in a salad before, instead I always tended to have it as a side on its own but I am so pleased I discovered this combination. In a jug mix the vegetable stock with the boiling water. 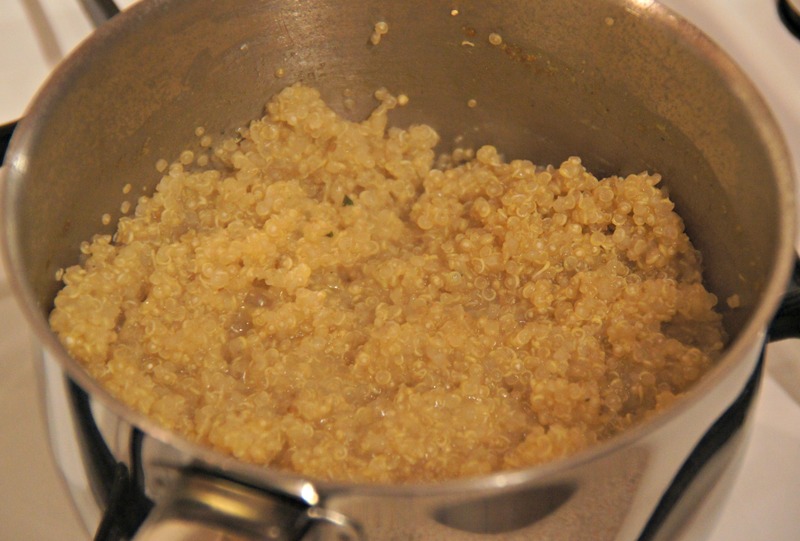 Place the quinoa and stock into a pan and bring to the boil, once boiling turn the heat down to a simmer and cook for 20 minutes until quinoa is soft. A little extra water may need to be added during cooking. Whilst the quinoa is cooking prepare the rest of the salad. 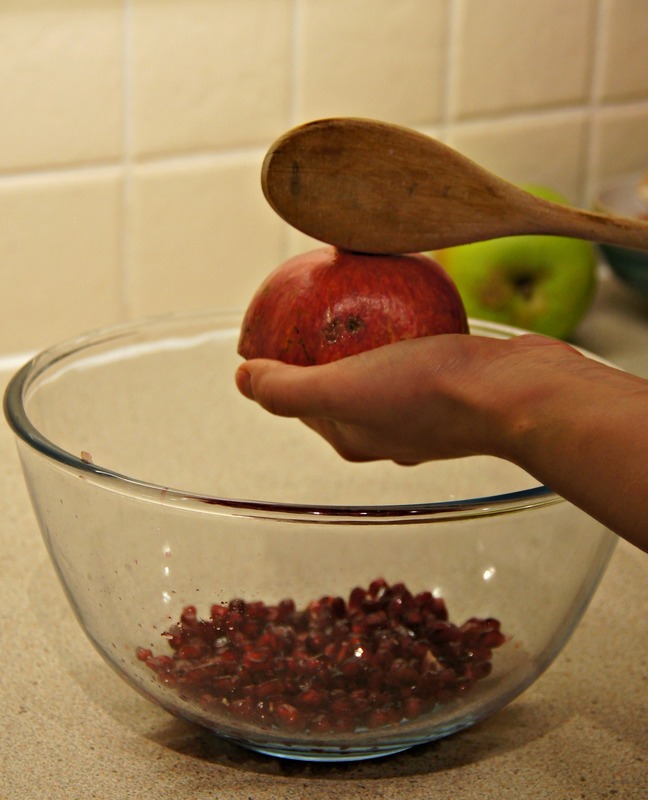 To deseed the pomegranate, cut it in half, ease the sides of the pomegranate and then over a bowl place half a pomegranate face down in your palm and bash the back of it with a wooden spoon and watch the seeds fall out and then put to one side for later. Chop up your spring onions, thinly slice 2/3 of the red cabbage and draining and rinsing the cannelloni beans, place all these ingredients together in a bowl. 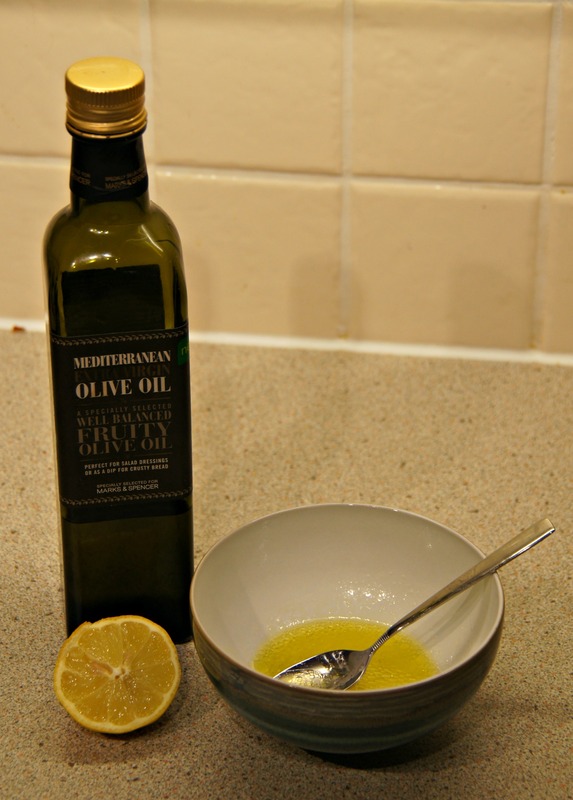 To make the lemon oil dressing, juice a lemon or two and place 70ml of juice into a jug or bowl and then add 70 ml of a good extra virgin olive oil to it and stir. Once the quinoa is soft and cooked, most excess water should have cooked off otherwise strain the quinoa and simply add the quinoa to your bowl of the copped vegetables, mix together and then add the lemon dressing and stir. While that sits and takes up the dressing, pan fry the halloumi on a low/medium heat. No oil is need in a non stick pan, as there is excess moisture in the halloumi which will leach out. Fry each side for about 2 minutes until golden. 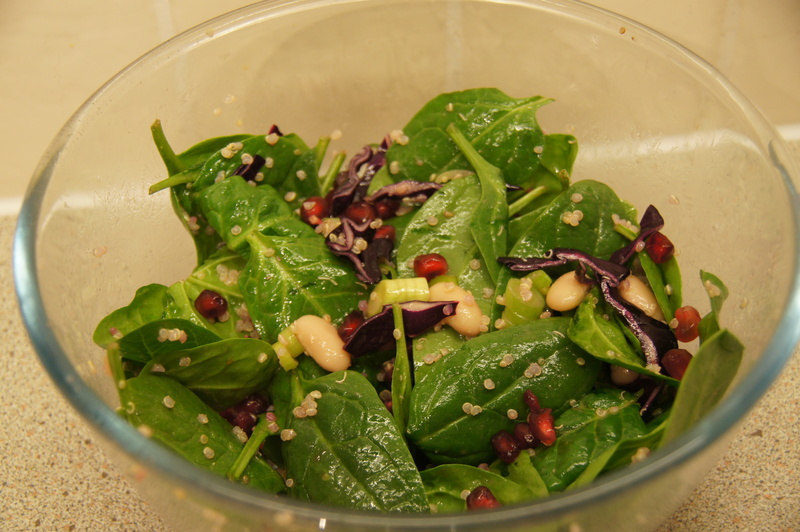 Finally in a large bowl place the quinoa mix, pomegranate and spinach and lightly toss together. Divide between four plates and top each with a crown of warm crispy halloumi. 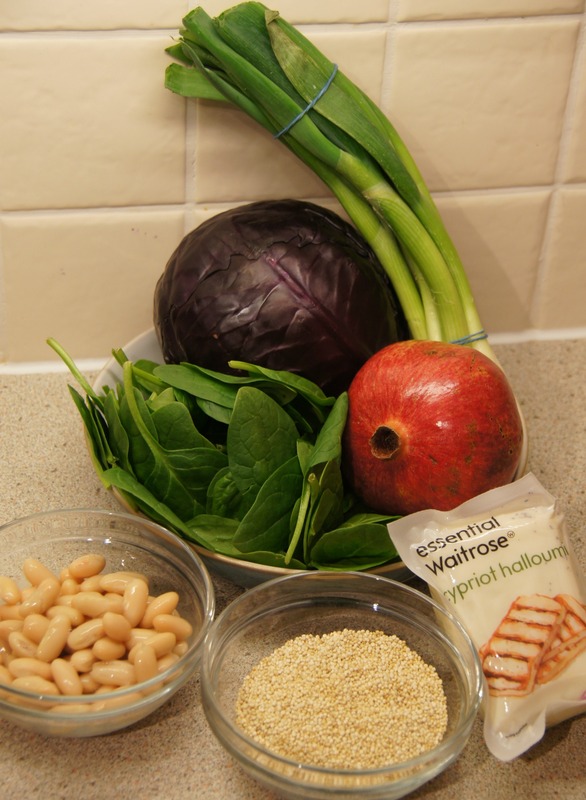 This entry was posted in Dinner, Lunch and tagged cannellini beans, gluten-free, halloumi, pomegranate, quinoa, red cabbage, shedding the wheat, spinach, spring onion, vegetarian. Bookmark the permalink.